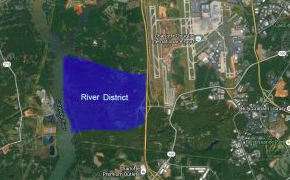 Just east of Belmont, between Charlotte Douglas International Airport and the Catawba River, lies Charlotte’s River District, the newest, massive, mixed-use master-planned development to hit Charlotte in decades. The potential for such a project, conveniently located right near the airport and only eight miles from Uptown Charlotte, is huge. This new development aims to create a walkable, urban environment that showcases a variety of housing in a community that really connects with nature. Developers plan to take advantage of the unique topography, woodlands, streams and creeks that the area is home to. While developers plan to build housing, retail space, office space and more, the plan for development also calls for preserving approximately 500 acres of land and using that land for mountain biking, walking and hiking trails with a walkable community laid out around them. Approximately 10,000 people will occupy the new homes here, which will range from very moderately priced homes all the way up to luxurious estate homes. With the hopes of having some of the trails open to the public possibly as early as the summer of 2017, as well as completing construction on the first stage of the residences in the next two years, final completion of the entire project, which is slated to be as big as Ballantyne occupying approximate 1,400 acres, is not expected for about 30 years. The project will be completed in stages, but given its size and scope, it will certainly take quite a bit of time. Stay tuned for the ongoing development of the River District. And, for more details and information on the project, check out the article at WCNC.com.